"You can cook this dish as often as you like between mid-August and the end of October with a different variety of plums every time," say Sarit and Itamar. "Greengages are lovely in it, as are sweet mirabelles and spicy damsons… The results will be slightly different but always delicious." What's more, the recipe is an easy mix-and-bake number, and makes for great leftovers. Make the marinade by blitzing everything together in a food processor until you have a super-smooth purée. Pour the marinade over the chicken thighs and mix well to make sure they are evenly coated. Cover and place in the fridge to marinate: a couple of hours will do the trick but try to leave it for up to 24 hours. Heat your oven to 220°C/200°C fan. Place the celery, onion, garlic and half the plum quarters in a large roasting tray. 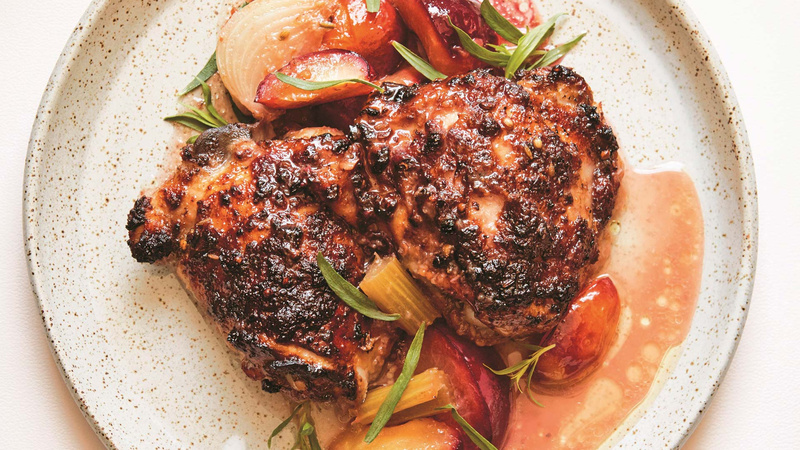 Top with the chicken thighs, skin-side up, and pour any remaining marinade over the chicken. Season with some salt and pepper. Roast for 20 minutes, then remove the tray and baste everything well with the juices that have formed at the bottom. Reduce the temperature to 200°C/180°C fan and return the chicken to the oven for a further 10 minutes. Add the remaining plum quarters to the tray. Sprinkle with the sugar and roast for a final 10 minutes. Remove from the oven, baste again and garnish with the tarragon. From At Home: Middle Eastern Recipes from our Kitchen by Sarit Packer and Itamar Srulovich; photograph by Patricia Niven. Published by Pavilion Books.